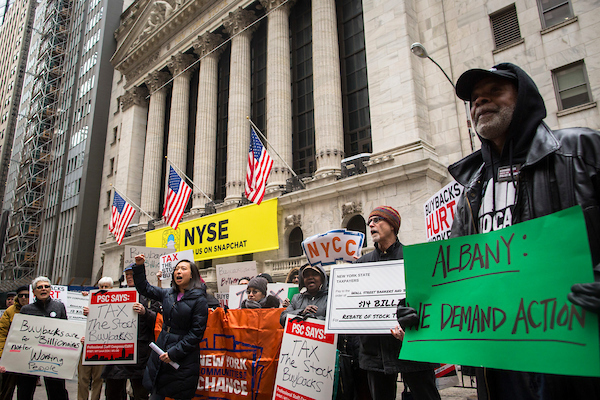 New York, NY – As Albany legislators and Governor Andrew Cuomo work to finalize a state budget by the end of the month, typical New York taxpayers demonstrated today at the New York Stock Exchange, urging them to implement a Stock Buy Back Transfer Tax. 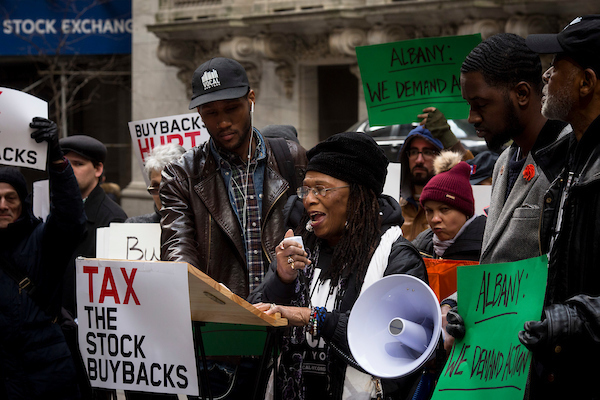 A .5% transfer tax on stock buyback trades could raise $2 billion a year in New York for affordable housing, healthcare and quality public education from kindergarten through CUNY. Pepsi Co, which has announced $15 billion in stock buybacks in 2018, is planning 200 layoffs in Westchester county. Wells Fargo, which has a long list of corporate misdeeds, has announced $22.6 billion in stock buybacks. Community groups, unions and lawmakers are calling for them to pay their share of taxes in New York. Click here for a list of more than 40 corporations who have announced a total of $209 billion in stock buybacks in 2018. 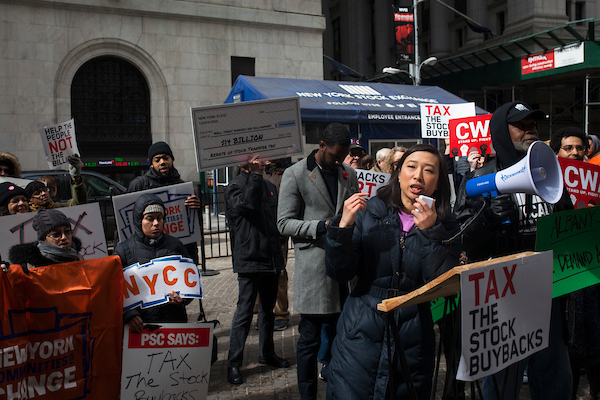 Assemblymember Yuh-Line Niou (D-WFP), whose lower-Manhattan district includes the Financial District, spoke in support of the Stock Buy Back Transfer Tax. "The concept behind the Stock Buyback Transfer Tax is simple—right now, big money interests are trying to buy back their own stock because of the huge amount they are now getting back from not having to pay federal taxes, so we want to enact a tax on these buybacks to ensure that big corporations are paying their fair share. 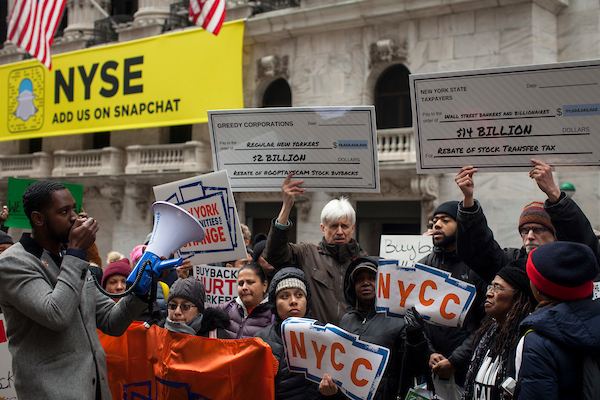 We can't just stand by and allow those at the top to keep pocketing dollars that should go toward healthcare, affordable housing and livable wages for all New Yorkers,” said Assemblymember Niou. “We pay taxes on anything we buy. Why shouldn't big corporations have to pay taxes when they are buying something? This is a much, much smaller tax than the one everyday people have to pay when we go to the store to get a toothbrush or a pair of shoes, and it can go a long way toward helping working- and middle-class residents in our state." The current budget being debated in Albany fails to adequately invest in critical public institutions and services. New York is dealing with the worst homeless crisis in our state’s history. Between 2011-2015 statewide homelessness increased by 41%. Over 89,000 people are living in shelters throughout the state. Without aggressive state action, people will be left to languish in the shelter system. The City University of New York, which has historically helped launch low-income New Yorkers into the middle class, has seen per-student funding at its senior colleges decline by 18% since 2008, adjusted for inflation. 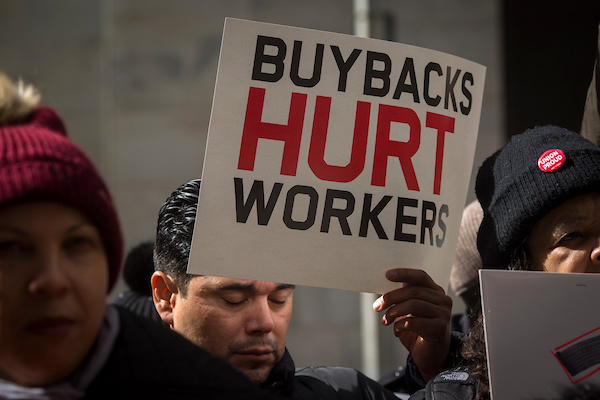 The push for a Stock Buyback Transfer Tax is part of month-long campaign to ensure that New York’s budget is not balanced on the backs of working people. In the coming weeks, coalition groups will be meeting with lawmakers, demonstrating outside key legislators' district offices, and staging creative events. The Patriotic Millionaires & Responsible Wealth will bring one-percenters who want to pay their fair share to Albany. NYS Council of Churches will bring "Nuns on a Bus" to Albany to call for more progressive tax policies. 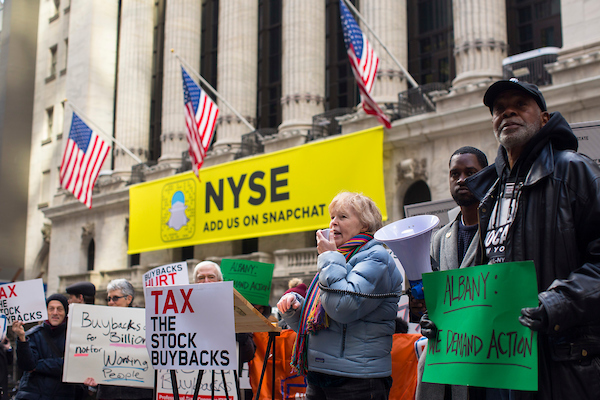 The Stock Buyback Transfer Tax is a way to ensure that one percenters who benefit most from the new federal tax law pay their fair share in New York. New York State currently REBATES $14 billion a year in Stock Transfer Taxes to brokers. This proposal would capture some of those profits to protect vital state funding.